Having bought a bunch of different emulator consoles I have decided to review them for people who may be curious about whether they should buy them or not. In my collection I have the Dingoo A380, JXD S5110, JXD s602 and soo to have the JXD a1000 and a JXD ripoff. I will start with the Dingoo A380 since it is similar to my first one (being the A320) and since it is by far the most popular. The A380 is a mixed bag of features. It plays old console games such as Genesis, Arcade, NES, SNES, Sega Master system, Neo Geo, CPS1 and 2 and various others if you get the modern firmware. It will receive radio and play videos. It will play MP3s and other formats of audio. You can also read E-books and various other things. As with most of these Chinese devices, they try to be everything and do very few things well. But playing games well is something it does well. Here is a Pro-Con list of my impressions of the Dingo A380. Small form factor, fits well in pocket. Simple interface, usable rather quickly. Most sellers will have games already installed but they’re usually in Chinese. Plays GB, GBC, CPS, Genesis, SMS and other custom emulators reasonably well. Allows use of wireless controllers, of course they are proprietary. Nicer aspect ratio of screen for movies. playing old games though the filled screen becomes quite squat. For most things this is the best hand-held emulator out there. No touchscreen. It may be a con for most but I hate touchscreens, I like the nice sturdy screen on the Dingoo. The aforementioned small form factor is also a pain if you have large hands. Playing this can become painful especially with the square corners. L and R buttons are too small and set too far to the outside (for adult hands anyways). There is no button(s) for volume control, this must be done with the software. SNES emulation is atrocious, even with a updated firmware. Mode 7 games absolutely decimate its performance. Very little to configure. changing some stuff that’s bothersome can be impossible. In some emulators, they removed the ability to hotkey savestates. Power button is flimsy, it’ll probably break relatively soon. Anyways, that is simply my opinion. 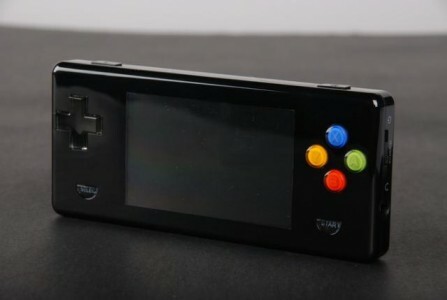 As of Dec, 2012 the average price on Ebay is about $130 which is what you can get a JXD 7100 for. Mind you, this is probably the best emulator for the older games that you like and it have reasonable battery life. That said, the battery life of about 4 hours pales in comparison to the A320 which seemed to have better emulation and you could get it with Dingux. The new firmware (not from dingoo) is also a must if you like some of the more obscure emulators. If you like emulators and aren’t scared of the price, I heartily recommend. Previous Previous post: My trip to Jasper, in photos.